REVOLUTIONARY WAR is the perfect way to learn about the American Revolution. This program combines paintings, first-hand accounts, multimedia presentations and documents to tell the complete story of the America's march toward independence. 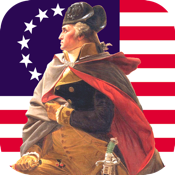 Our REVOLUTIONARY WAR app makes full use of the capabilities of the iPad, iPhone and iPod Touch. The program allows you to mail, or print any presentation or text. REVOLUTIONARY WAR makes use of Air Play to allow you to play your videos through an Apple TV. Major sections of the program include: Causes of the War, Major Battles and Events, 200 biographies, Myths and Stories, The Journals of the Continental Congress, Letters Between John and Abigail Adams, Diary of the Revolution, Americans of the Revolutionary War period, Economics during the War, Documents of the Period. REVOLUTIONARY WAR is an essential tool for students of all ages.